It appears that fifth season is upon us. No, not road construction, but rather Bee season. It visits my house every July and keeps me on my toes protecting this old castle of mine. This years onslaught actually started last week while I was in San Diego. Evidently, Ben saw the wasps going into and out of a couple of small nests by our back door. And we certainly cannot have that. While I'm a big fan of honey bees, I have no time for hornets and wasps. I'm sure they serve a purpose, but frankly they scare the heck out of me, and I don't want them around. These past few years the long legged paper wasps have taken to various nooks and crannies of my house and garage. They typically start to establish a pretty good paper nest before I break out the killing techniques. I typically have one two-step technique. 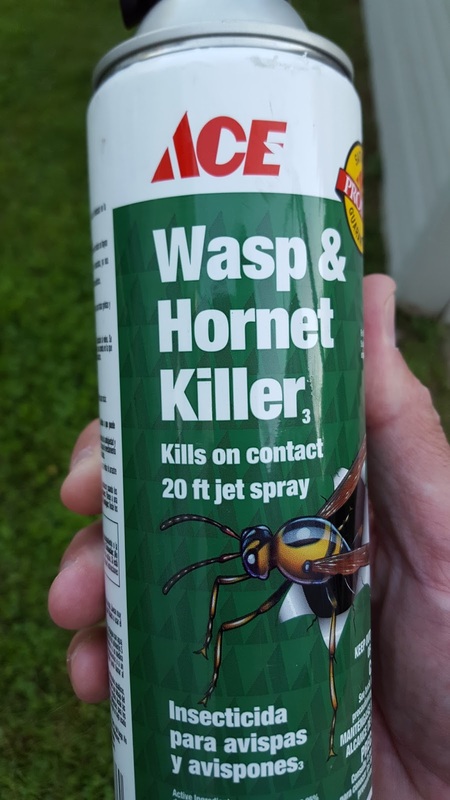 Blast them with bee killer jet spray and run like hell. 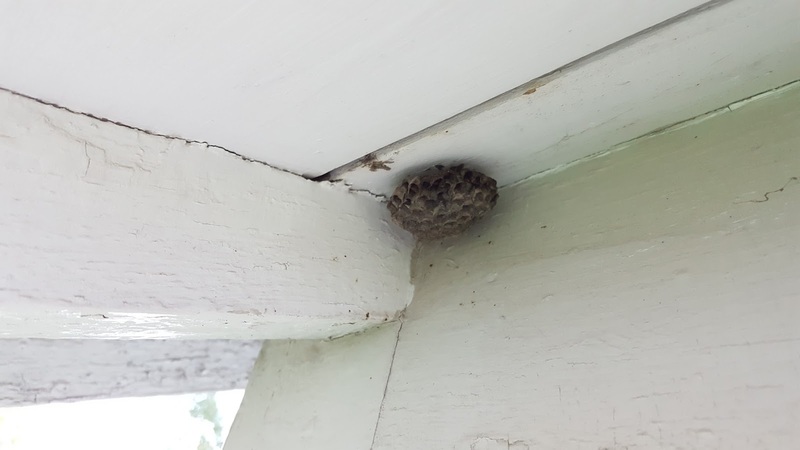 So I hit the first three nests over my back door thinking I had them all. 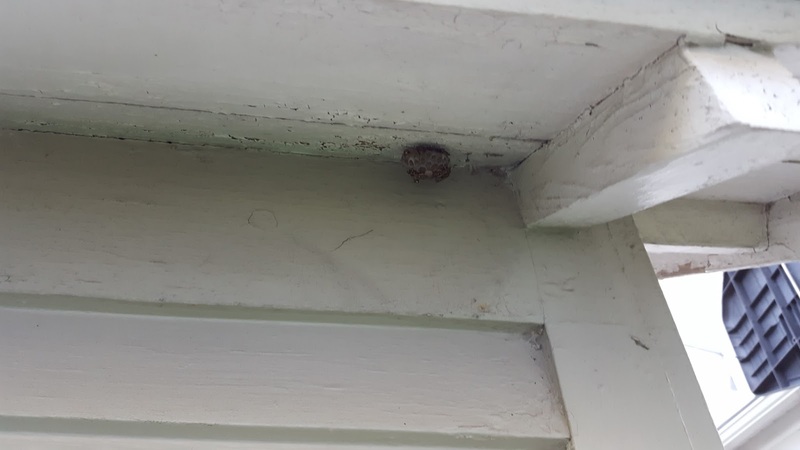 I later found another five bee "starter homes" hanging from the house and garage. All of them are overhead which means that I usually get dusted with bee killer spray fallout, which I'm pretty certain will manifest itself in the form of a tumor or pancreatic cancer in a few years. I consider it the price I pay for securing the perimeter. One of the nests was developing on the second floor, which meant getting out the extension ladder. What could possibly go wrong with a can of poison in the hands of a man terrified of heights on a ladder 20 feet in the sky? So up I went with a broom in one hand and bee killer in the pocket of my cargo shorts. The broom was to attempt to tuck in one of my siding shingles that was askew. Figured I'd just nudge it back into place. Up the ladder I went and about 3/4 of the way up I got the old heebies. Then the voices come to the surface. Cripes sakes it's high up here. If I fall, I'm dead. Is the top of this ladder sliding toward that window? Needless to say the shingle tuck did not go as well as I'd anticipated. The broom provided just enough reach to knock it into "better" position, but not "ideal" position. When you're at that height, it's amazing the compromises that can be made in my mind. I made one here, in a hurry. Do It Yourself Extermination LLC. Finished with the broom, I dropped it to the ground. I didn't need anything more to think about than my 10 fingers losing their color as I gripped the ladder and started working toward reaching the spray in my pocket. Once I got it, I took aim and blasted away. Again I got rained down on by the spray's fallout. My pancreas hates this time of year. After that blast, I slowly inched my way down the ladder. There were a couple of anxious moments where I wasn't sure I could move. Gridlocked to my ladder. The whole experience was a reminder that I will not be painting this house myself, when we decide to paint it again. So I have the bees to thank for that. this does not sound like a 4th of July story. But it is a Jim story, and they don't get any better. Stay on the ground. How about fireworks?